The first line of The Saw Doctors’ Wikipedia entry simply reads ‘The Saw Doctors are an Irish rock band’ and while that may seem expository of the seemingly lazy research done on the part of a music writer for a University Magazine, it actually says a lot in it’s simplicity. Hailing from Tuam, Galway, the band have always stood by their own brand of unpretentious sing-along, three-chord rock, which has clearly stood the test of time and earned them a devoted fanbase both at home and abroad. Through the nineties, The Saw Doctors chalked up well-received appearances at numerous prestigious festivals including Witness, Oxygen and Slane in Ireland, Glastonbury, T in the Park, the London Fleadh in Britain as well as at its Fleadh cousins across the Atlantic and garnered a reputation for being a powerful and exciting live act. Now they’re back on the road where they await a sold-out show in Dublin’s Olympia Theatre. 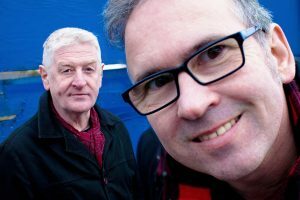 Having spent the better part of the last decade in Galway where The Saw Doctors (or simply ‘The ‘Docs’) have become legends, I was curious to hear from the band themselves about the songwriting process, their future and what exactly it was that has helped them to endure so long.